When it comes to repurposing old buildings with style, Apple takes the prize. On March 9, the technology company will be honored by the New York Landmarks Conservancy—a group that works to preserve notable architecture—for its elegant restoration and repurposing of historic buildings in New York City. Apple will receive The Chairman's Award for “marrying high tech and distinguished architecture,” as the Landmarks Conservancy puts it. The Chairman’s Award was created in 1988 to recognize companies and organizations for their contributions to maintaining New York architectural heritage. 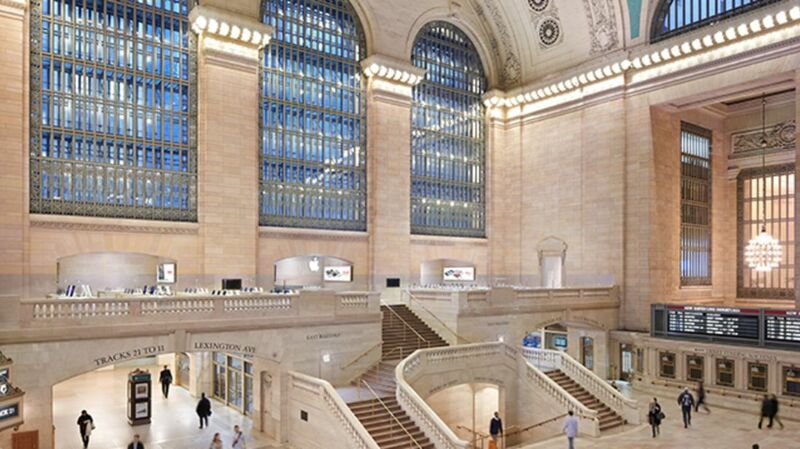 Apple has stores in several historic districts in New York City, including Grand Central Terminal (a city landmark), the SoHo Historic District, the Gansevoort Market Historic District, and the Upper East Side Historic District. All of those buildings were designed by the architecture firm Bohlin Cywinski Jackson, a company that has built 10 of Apple’s retail stores around the world, including the eye-catching glass cube at 57th Street and 5th Avenue in New York City. The SoHo Apple store at103 Prince Street was the company's first in New York City. The architecture firm's stores blend Apple's modern, minimalist aesthetic with the Beaux Arts grandeur of buildings like Grand Central Terminal and the former U.S. Mortgage & Trust building from the 1920s (where the company's Upper East Side store now resides). All images courtesy Apple via the New York Landmarks Conservancy.